This delicious soup is one of the easiest soups you've ever made. Just 3 oz. of muscles has 20 g of protein and over 300%. Try this warming recipe any time of the year, for a tasty seafood dinner meal rich in B vitamins, protein, and healthful nutrition. If you're looking for a way to get more vegetables into your diet what better way than swapping out white rice for... white rice... cauliflower style! Cauliflower is one of our cruciferous vegetables and has the ability to help protect against cancer due to sulforaphane, a sulfur compound that has also been shown to kill cancer cells and reduce tumor cell growth. Looking for a refreshing summer salad? Get creative and look past a simple green salad and make it a marinated mediterranean style dish with seasonally sweet cherry tomatoes, hydrating cucumber, and detoxifying parsley and lemon/lime juice to add some zest. With under 5 ingredients, this is an easy, simple and delicious side salad to add to your summer dinner table. Add all ingredients in a bowl (produce washed and sliced) and mix until lightly well combined. Drizzle olive oil and lemon/lime juice and let sit in the refrigerator to chill before serving. Enjoy as is, over microgreens, or serve as an appetizer with whole grain pita. Breakfast Egg Pizzas?! My clients are always looking for easy ways to make breakfast happen which is why I'm posting this! Whether its a breakfast, pre or post workout meal/snack, I've even used this recipe as an easy & delicious grab and go option for a meal or snack! So my first experience of the traditional French Niçoise Salad was actually in the south of France, in a beautiful town called Nice (one of my most treasured trips and experiences). I was traveling with a nutrition study abroad group and we learned how to make this traditional dish from a local registered nutritionist in that area of the country. 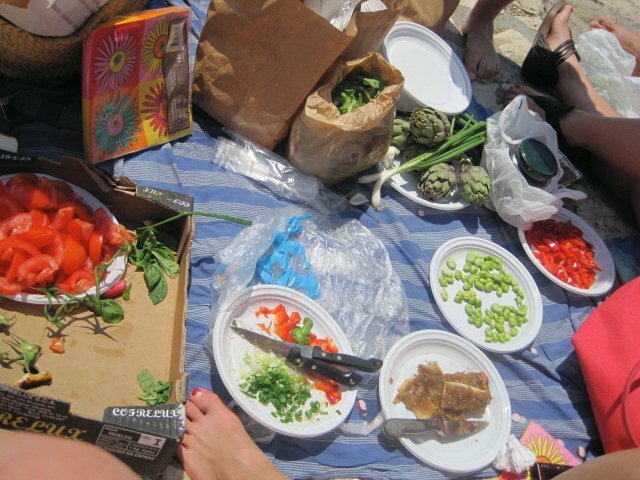 All local ingredients we picked up at the market, and then we prepared on the rocks overlooking a beautiful landscape of beach, water, and blue skies. This meal holds a special place and I hope you enjoy it as much as I did - and still do! Traditional Nicoise Salad is served with anchovies and fingerling potatoes and artichokes. First get 2 small pans boiling with hot water. Chop your red onion, wash and roughly chop lettuces. The water should be boiling soon, so drop in your eggs to cook for 12 minutes, additionally boiling your green beans for about 5 minutes (or until vibrant green). Once green beans are bright green remove from heat, strain and blanch with ice cubes/cold water to stop them from continuing to cook. Sear your steaks on a medium-hot pan or grill (~3-4 minutes on one side and about 1-2 minutes on the opposite side). These cook very quickly and the key is to not cook them all the way through - they should be slightly pink in the center. While cooking the steaks, have your green beans boiling in hot water for about 5 minutes. Add all ingredients to two salad bowls. Toss with salad dressing (olive oil-lemon juice-crushed garlic-salt-pepper). Serve seared tuna steaks over the prepared salad. This juice has incredible detoxifying properties for the liver and may help prevent and reduce cancer cell growth due to its cruciferous veggie - broccoli! Red Beets are one of my favorite vegetables to add to my juices! It gives this beautiful red vibrant color which comes with a TON of nutritional benefits; everything from improving heart and cardiac function, proving anti-inflammatory benefits, opening blood vessels and improving athletic performance. Get the recipe! This juice contains cucumber, celery, apples, bell peppers and lemon it gives you 3 large servings (16-20 oz. each serving). The combination of veggies gives you a juice high in antioxidants, Vitamin C, beta-carotene and manganese. Drink up - this is a green JUICY juice! Make these sweet little candied favorites to have on stock in your fridge all week. Perfect for a post-workout snack, pre-workout fuel, to add to a seasonal winter salad, whip up into a soup, or just toss as a side with your morning eggs or dinner rotisserie chicken. You're unlocking the suns harnessed powers within the plant cells to provide your body wonderful nutrition! A juice for Vitamin C, detoxification, and hydration. Did you know Bell Peppers have more vitamin C than an orange?! Healthy Fats are important to maintain cell membranes, to hold together our cells and even absorb nutrients from our food. Without enough healthy fats, you may have dry or cracked skin, brittle hair and nails, weight loss or weight gain, trouble focusing, hormone imbalances, and a variety of other cascading effects. Avocados are a great source of HEALTHY FATS to incorporate around the snack table, appetizer platter or to have alongside a healthy meal like eggs or taco Tuesday. Enjoy this festive guac around the Holidays - I just loved the combo of Red & Green!! DE-SEED AVOCADOES. Slice avocado in half, remove the center pit. SCOOP OUT & MASH. Scoop out the avocado, add to a small bowl and mash until you reach desired consistency. SEASON. Add kosher salt, pepper, and lemon/lime juice. SERVE. Serve with whole grain pita chips or my favorite dip with apple slices! You can also serve this on a chicken wrap or salad, or serve on the side of eggs for breakfast. I know what you're after.... salty chips, sweet candies, and creamy textures. OK, lets take out the processed ingredients and create a satisfyingly sweet, salty and creamy snack! My mom tends to buy the processed salsas, and there are always pretzels and candies lying around. But with a recipe that stretches FAR on the $$ and gives you so much more amazing nutrients (because the enzymes aren't destroyed as they are in packaged sealed containers at the stores). You get a wonderful amount of lycopene in the tomatoes, immune, antioxidant and digestive boosting properties from your pineapple, and even some anti-viral and anti-inflammatory properties from your garlic and onion. Wash and add all ingredients to a large food processor (you may need to roughly chop the yellow onion, and remove the head of the tomatoes). Pulse about 30-60 seconds until you reach desired consistency. 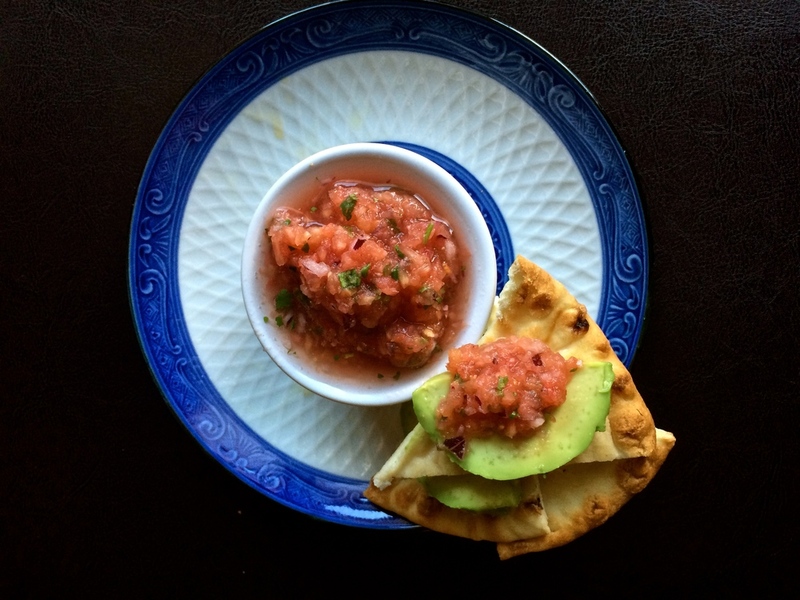 Chill and serve with a side of toasted pita bread with a sliver of avocado for that healthy fat and creamy texture. Keep 1 banana (break in half) and a handful of frozen berries in a ziplock bag of plastic container in the FREEZER. It makes the smoothie more creamy, sweet tasting, and takes off 30 seconds from peeling, throwing away, opening the frozen berries etc. There are a lot more than just "apples" that can make a juice sweet and tasty. If you are looking for a sweeter tasting drink (attractive to kids and adults new to juicing), but don't want to JUST be drinking pure apples with a handful of spinach, then try this recipe! It has apples and a whole lot more! It's filled with a combo of veggies & fruits that provide beta-carotene, anti-oxidants, and nutrients good for your heart health, prevent and reduce inflammation, and even help to boost oxygen uptake in the cells. Drink up! Add all ingredients to your juicer and serve cold over ice. Enjoy! Are you new to juicing? Never tried it and think that you just hate all veggies so why would this weird green drink be ANY different? Well my friend, that's where we can start to play, have some fun and customize your juice to fit where you are at! Try this recipe which is a little higher in fruits and sugar than most of my other juice and smoothie recipes. This is the perfect juice to share with kids or to adults who are new to plant-based eating and skeptical if this "green stuff is any good"
I assure you that after this recipe they will be begging for more!! 1. Wash produce well. Peel pineapple. Put produce through the juicer chute and serve over ice. Blood Mary anyone? This is the real deal - no processed junk, pasteurized tomato juices, just fresh veggies for a spicy non-alcoholic cocktail (but feel free to add some vodka if that's your fancy). Tomatoes are rich in the nutrient lycopene, which is good for heart healthy and helps to improve blood circulation. Add some jalapeño for a real spicy kick! Enjoy! DIRECTIONS: Wash all ingredients well. Add through the juicer chute. Serve over ice with a stick of celery to garnish. Add 1.5 oz of vodka if you want to make it an alcoholic cocktail. Berries are in season during the summer months so take advantage while you can! Blueberries contain the blue-purple pigment known as anthocyanins which is a powerful antioxidant. Antioxidants help to scavenge harmful free radicals and prevent cell damage. Berries are also lower in sugar than most fruits and are less likely to cause high blood sugar spikes. Pair blueberries with this perfect green smoothie for a delicious start to the day! TIP: If it's not the summer months, use frozen berries - they have just as much nutrients as fresh! Frozen berries will give a cold smooth finish too! ***This is a great option for diabetics or those looking for a low-sugar option to prevent spikes in blood glucose. Consuming juices, smoothies and foods lower in sugar will also help with weight loss goals and decrease inflammation in the body. Wash all ingredients well. Add ingredients to your blender and blend on high for 60-90 seconds or until smooth. Add more coconut water as needed. Serve over ice with a few berries sprinkled on top! Enjoy! !